Preheat oven 400 degrees Fahrenheit. Line a backing sheet with parchment paper. Rinse 1 1/2 pounds of Brussels sprouts. Cut off the ends of each of them, and then chop the Brussels sprouts in half. Place the Brussels sprouts in a large mixing bowl. Peel two large sweet potatoes, and then chop them into 1/2 inch pieces. 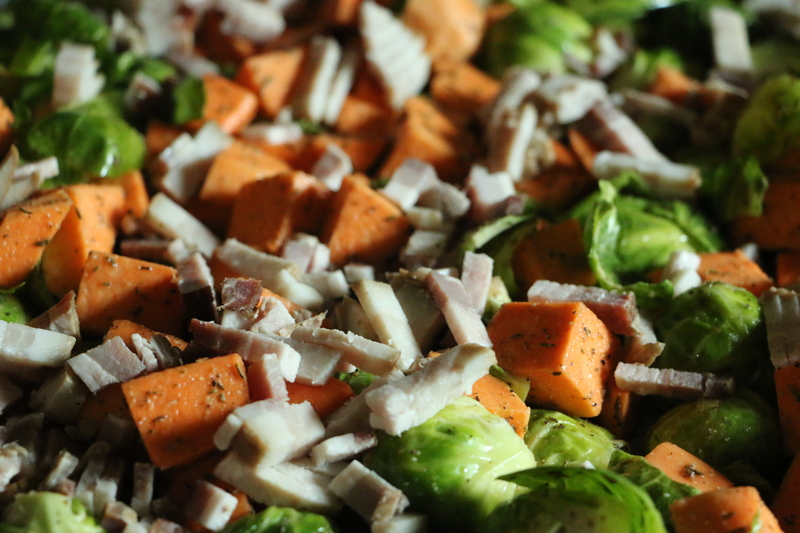 Place the chopped sweet potatoes in the bowl with the chopped Brussels sprouts. To the veggies, add 2 tablespoons extra virgin olive oil, 2 tablespoons balsamic vinegar, 1 tablespoon Italian seasoning, 2 teaspoons sea salt, 1 teaspoon black pepper, and 1 teaspoon garlic powder. Toss the veggies in the bowl to coat. Chop up 4-6 slices of bacon into thin strips (I typically cut the bacon in half lengthwise, and then chop it up into smaller pieces). 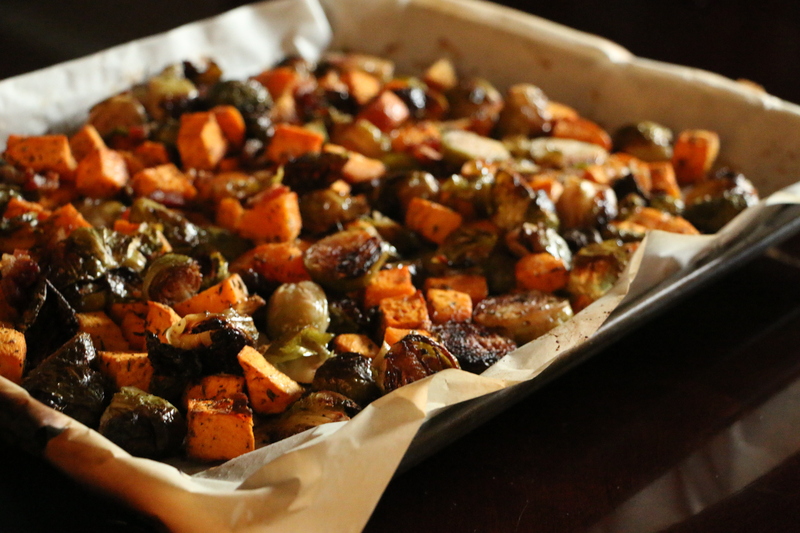 Spread the veggies on the tray, making sure to turn over each of the Brussels sprouts cut side down. Sprinkle the bacon on top of the veggies. Don’t be stingy with the bacon. Sprinkle those pieces everywhere! 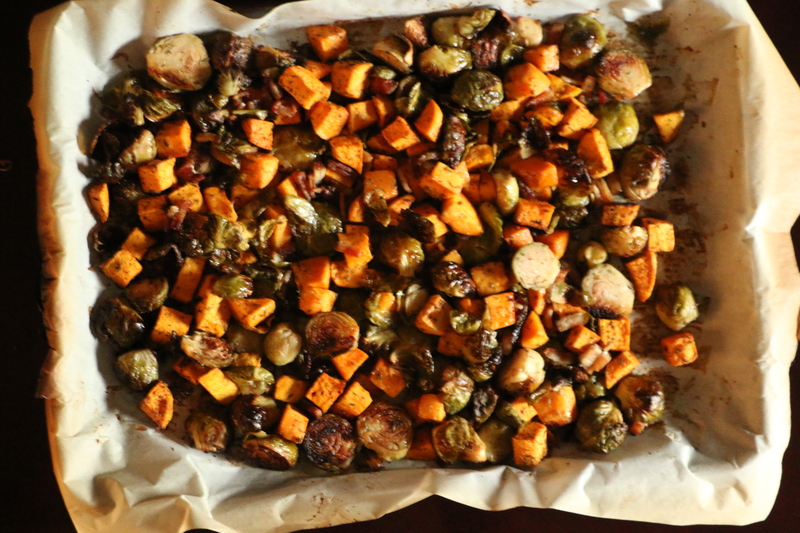 Place the tray in the preheated oven and bake for approximately 1 hour, until the sweet potatoes are cooked through. then serve and enjoy! Rinse the Brussels sprouts. 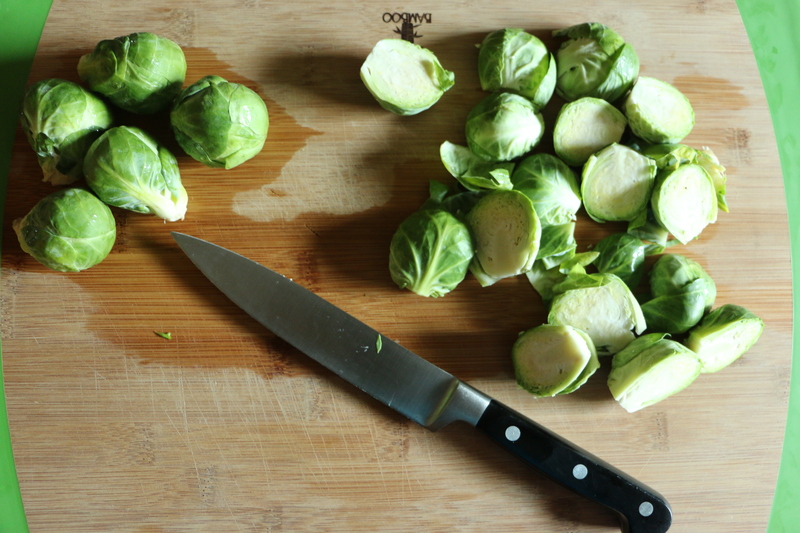 Cut off the ends of each of them, and then chop the Brussels sprouts in half. Place the Brussels sprouts in a large mixing bowl. 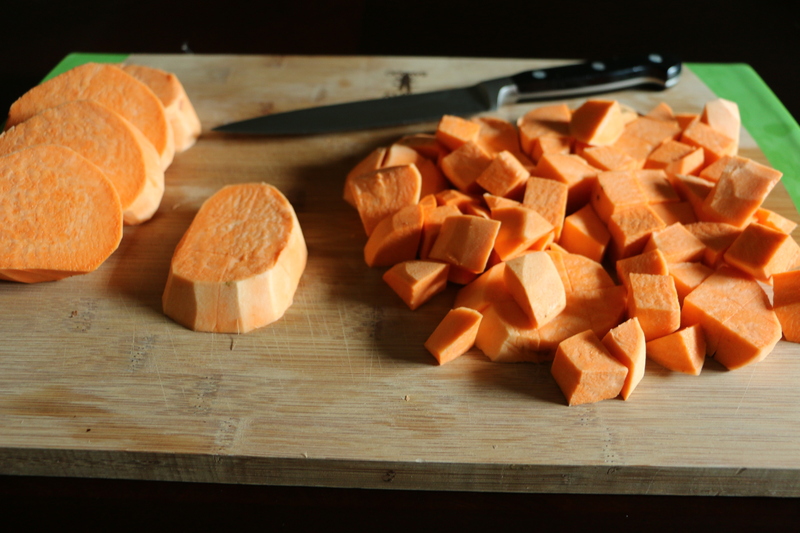 Peel two large sweet potatoes, and then chop them into 1/2 inch pieces. Place the chopped sweet potatoes in the bowl with the chopped Brussels sprouts. To the veggies, add the extra virgin olive oil, balsamic vinegar, Italian seasoning, sea salt, black pepper, and teaspoon garlic powder. Toss the veggies in the bowl to coat. 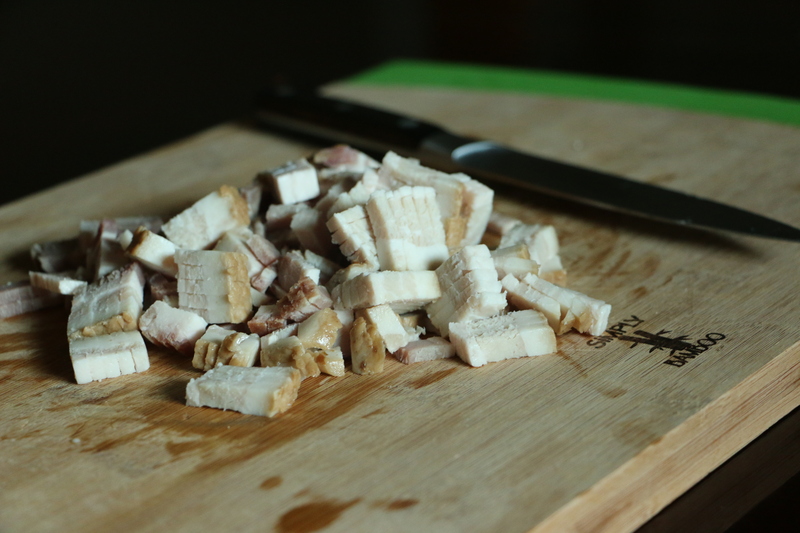 Chop up 4-6 slices of bacon. Spread the veggies on the tray, making sure to turn over each of the Brussels sprouts cut side down. Sprinkle the chopped bacon on top of the veggies. Place the tray in the preheated oven and bake for approximately 1 hour, until the sweet potatoes are cooked through. Transfer to a bowl, serve and enjoy! 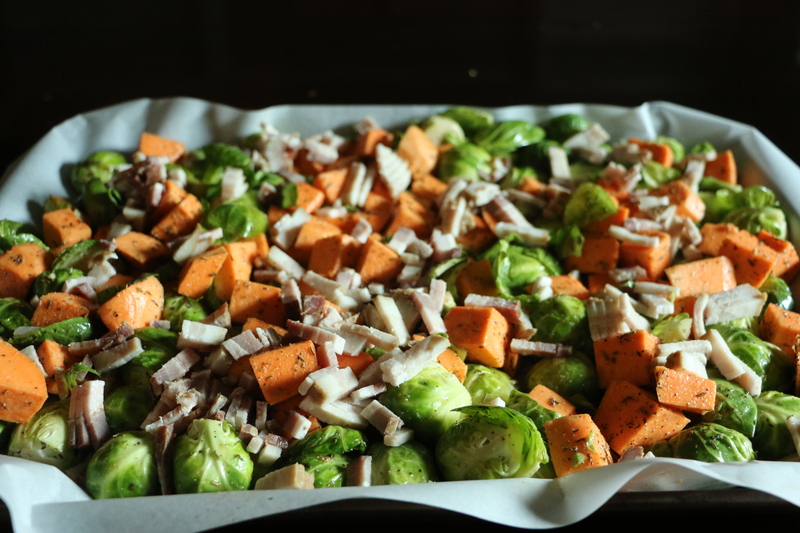 Tags: bacon, brussels sprouts, paleo, Primal, roasted vegetables, sweet potatoes, Whole30 | Permalink.